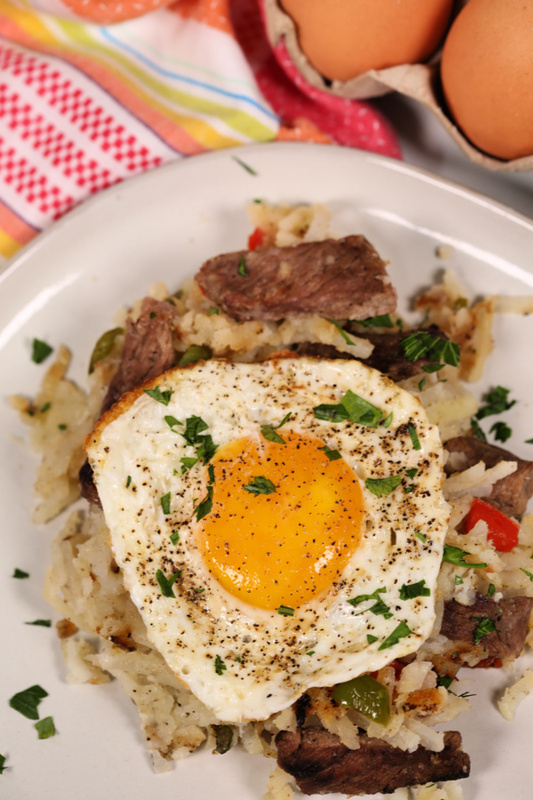 This easy Breakfast Skillets with Steak and Eggs is a hearty way to start your day. This post is sponsored by The Beef Checkoff. As always, all opinions are my own. There is no better way to start the day then with a protein-rich breakfast. 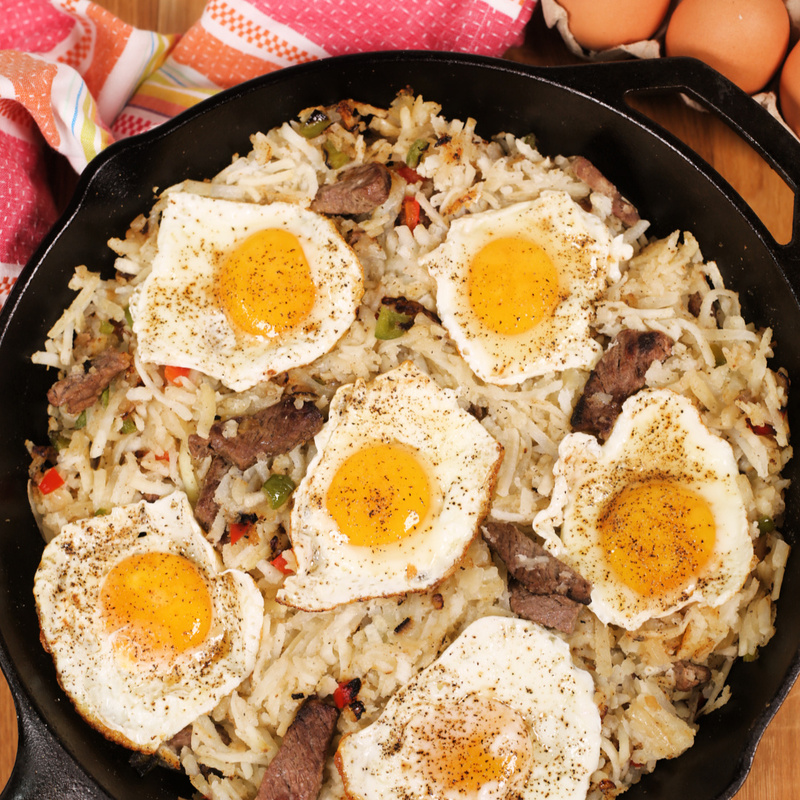 This easy Breakfast Skillet with Steak and Eggs is packed with protein and flavor! 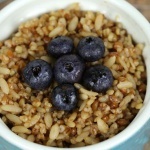 When it comes to breakfast, I love recipes that will fuel us up for our busy days. 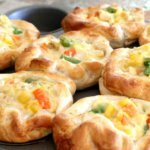 Often times, my family has a day packed with activities and we need a hearty breakfast that will keep us satisfied. 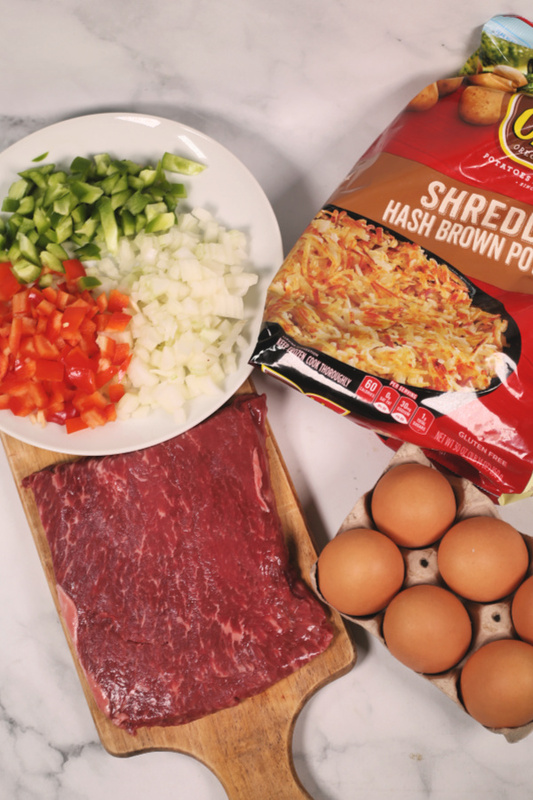 This healthy Breakfast Skillet with Steak and Eggs is layer upon layer of flavor. 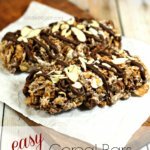 One of the things I love about this recipe is that it’s completely flexible. You can add any additional flavors that you like. There is nothing better than a one pot breakfast. I love when the entire recipe can be made in one skillet, building upon the flavors as you add new ingredients. 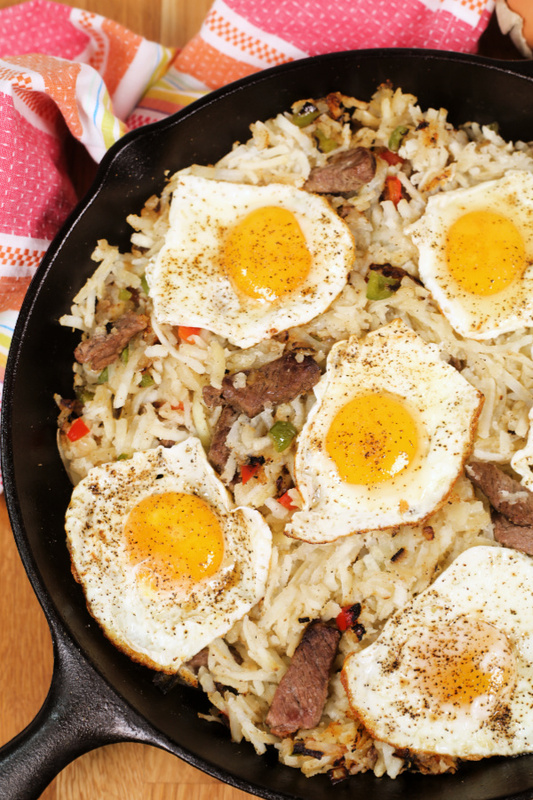 This recipe is the perfect example of a one skillet breakfast. I love it because it uses only a few simple ingredients. Begin by seasoning both sides of the steak. I use my House Seasoning Blend because it really brings out the natural flavor of the steak. You can also use my Steak Rub – the flavor is AMAZING! Next, slice the steak into quarter to half inch slices, going against the grain of the beef. Once your skillet is preheated, add the steak. Be careful not to move it around in the pan until you get a good sear on one side. Then, add the peppers and onions. By waiting to add the peppers and onions, you allow the steak a chance to develop a nice crust on one side. This is where the flavor is. That seared crust is pure flavor gold! 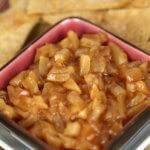 Once the peppers and onions have softened, you add the thawed potatoes. 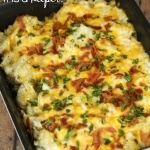 I’ve used both the shredded hashbrown style potatoes and the cubed breakfast potatoes. My family prefers the shredded variety but I encourage you see what your family likes. I think sweet potatoes would also be great. Simply, add the potatoes to the top of the steak and veggies and allow it form a crust on the bottom. After a few minutes, give it a stir to combine the potatoes with the steak, peppers and onions. The final step is to add the eggs. I used the back of a serving spoon to form indents in the top of the potatoes – just a little place where you can nestle the eggs down into the potatoes. I usually add 6 eggs but you can even increase it to 8 if your pan is large enough. Just crack the egg right on top of the potatoes and season it with House Seasoning Blend or salt and pepper. Let the eggs cook on top for a few minutes until it reaches the desired doneness. Personally, I love a sunny side up egg for this recipe. There’s something magical about the gooey yolk oozing down into the potatoes and adding richness to every bite. To make it easier to slice the steak into quarter inch slices, pop it in the freezer for 30 minutes. One of my best tricks for this recipe is to use a cast iron skillet. I love sear you get from a cast iron skillet. 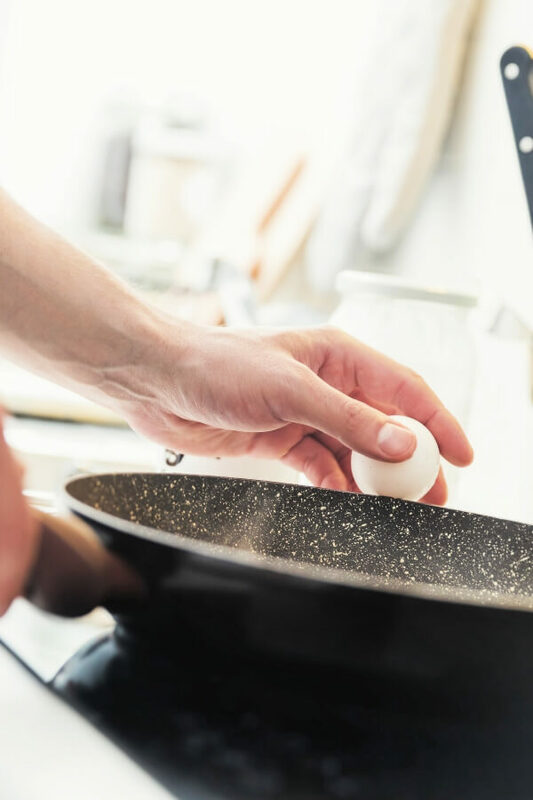 If you want to speed up the cooking process for the eggs, cover the skillet with a lid. 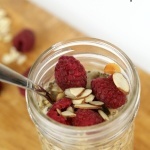 Get a jump start on breakfast by making this recipe the night before. Prepare the steak, veggies and potatoes according to the recipe and refrigerate in the skillet. When you’re ready to eat this dish, reheat it on the stove top – when everything is warmed through, add the eggs and finish cooking. 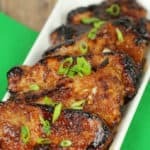 I’ve made this recipe many times and have used several different cuts of steak. My favorite, by far, is a Flat Iron Steak. I love the smooth, buttery texture of the Flat Iron Steak. I’ve also used ribeye steaks and even a leftover filet. If you want a more economical option, you could even use ground beef. The key to getting the best flavor from the steak is to season it properly. 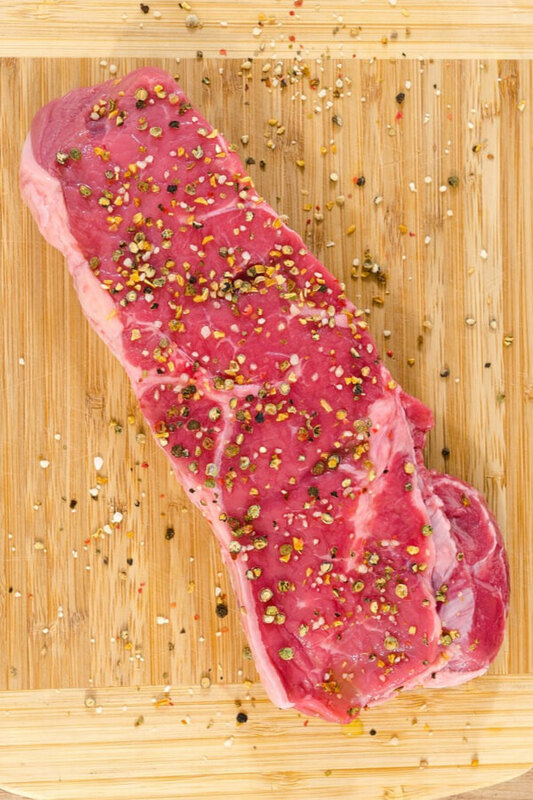 Usually, steak only needs to be seasoned liberally with salt and pepper. 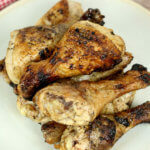 But you can add another dimension of flavor by using my House Seasoning Blend – I use it on everything! By eating a breakfast rich in protein, like this Steak and Egg Breakfast Skillet, you are fueling your body and brain. 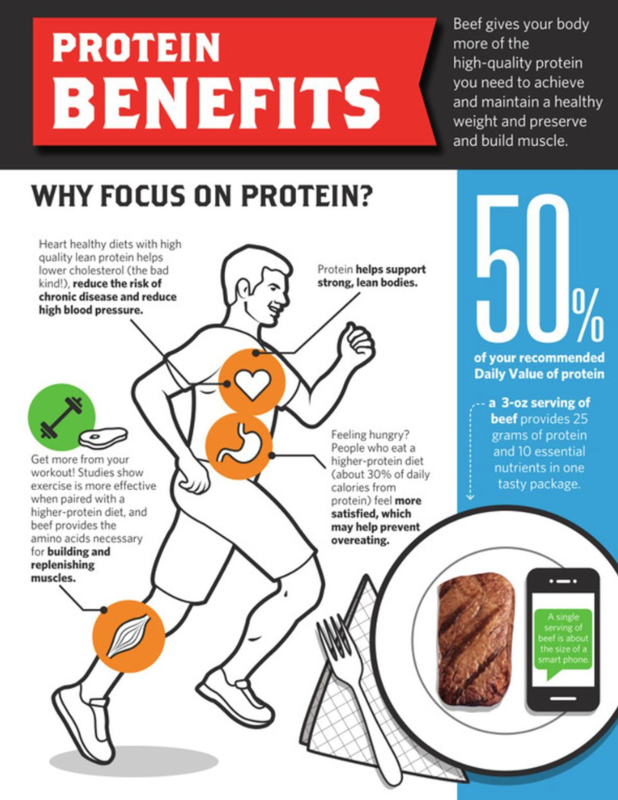 Protein helps us boost our memory, stay focused and fight fatigue. Just one 3 ounce serving of beef has roughly 50% of your Daily Value of protein. 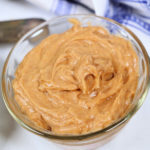 Plus, it’s packed with Vitamin B12, zinc and iron which help with everything from energy, metabolism and your immune system. It’s a real nutrition powerhouse! I’ve put together this handy Beef Cooking Cheat Sheet to help you understand the various cuts of beef. There’s even cooking tips, recommended temperatures, nutrition information and more! 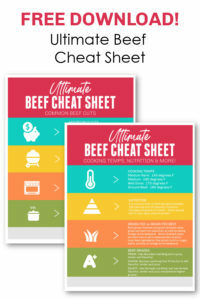 To celebrate the Back to School season, I’ve partnered with The Beef Checkoff to bring you an incredible giveaway. 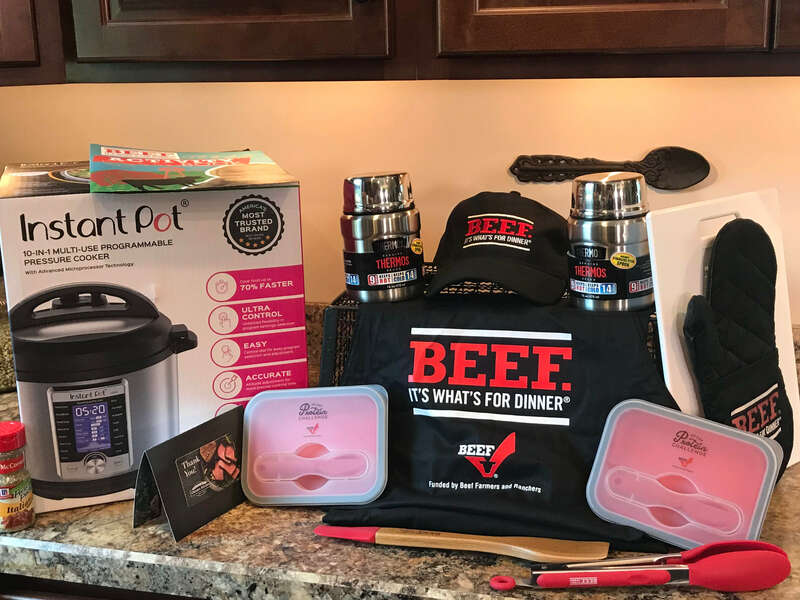 For the entire month of September you can enter to win this Beef Back to School prize pack valued at approximately $350. Beef themed swag including an apron, oven mitt, spatula and more! The giveaway will be open throughout September 2018 and the winner will be notified at the beginning of October. This giveaway is open to US residents residing in the Northeast (this includes residents of Maine, New Hampshire, Vermont, Massachusetts, Rhode Island, Connecticut, New York, Pennsylvania, New Jersey, Delaware, Maryland, Washington DC and Virginia). All entrants must be age 18 or older. Looking for more? 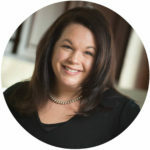 Check out all of the beef recipes on It Is a Keeper. And, be sure to visit The Beef Checkoff for more easy recipes. Season both sides of the steak with 1 teaspoon House Seasoning Blend. 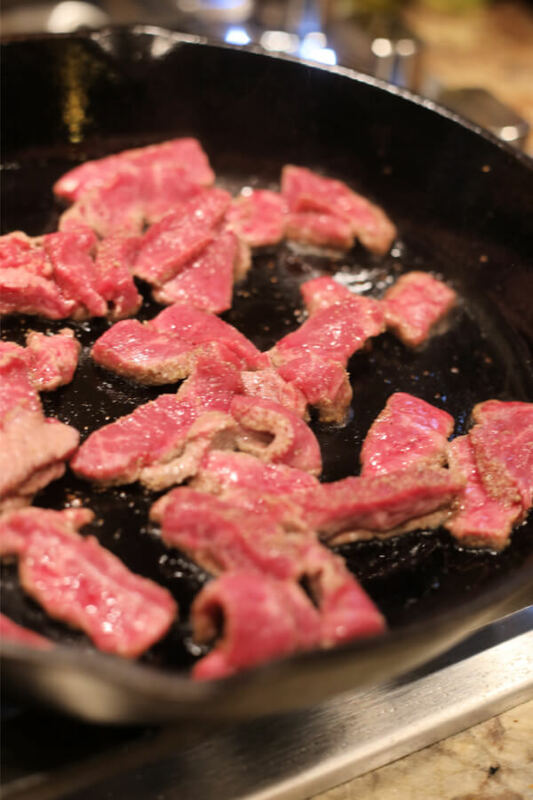 Cut steak into ¼-1/2 inch slices, cutting against the grain of the meat. Add steak to skillet and sear on one side, about 2 minutes. 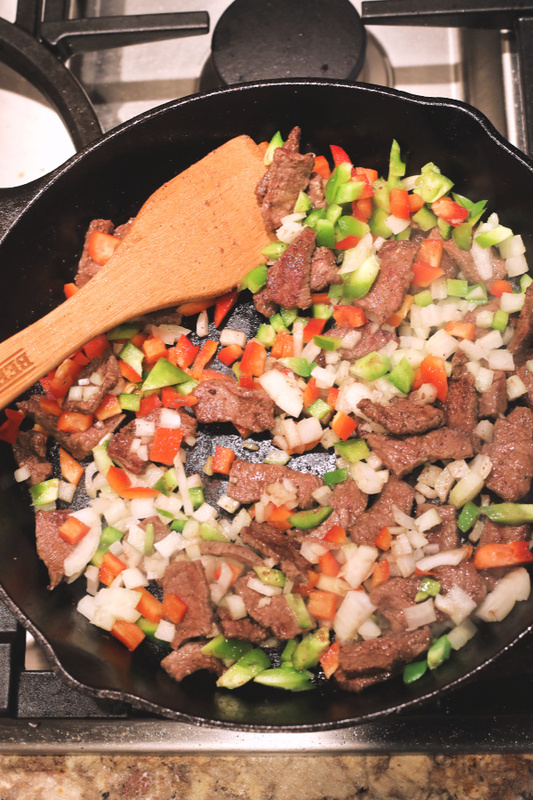 Turn steak pieces over and add diced onions and peppers. Saute peppers and onions for about 3 minutes, or until softened. 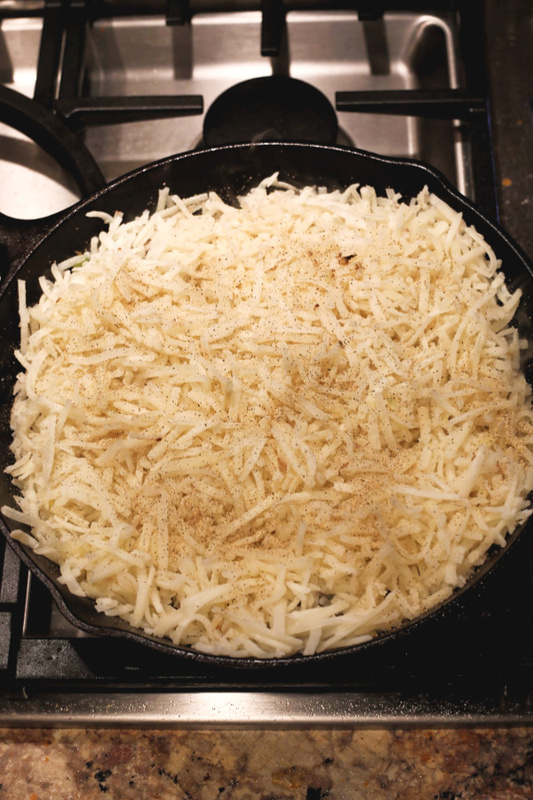 Stir in hash browns and season with one teaspoon of House Seasoning Blend. Cook, uncovered, over medium heat for 10 minutes or until bottom is golden brown; stir to combine. Use the back of a spoon to make six indentations into the potato mixture. Break one egg into each indentation. Sprinkle eggs with remaining House Seasoning Blend. Cover the skillet and reduce heat to low; cook for 10 minutes or until eggs are set and potatoes are tender. Yum. 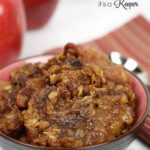 I love your recipies! Keep ’em coming! Well I now am adding Flat Iron Steak to my lost for today! This looks amazing. And something for everyone in the family! Kurt loves steak and eggs, so as soon as I saw this recipe, I knew I had to make it and it definitely did not disappoint! OMG! So delicious! 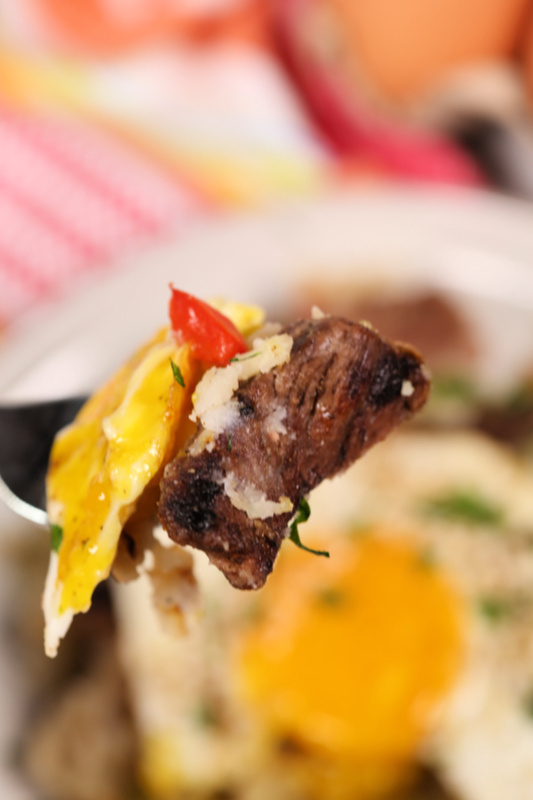 I forgot how much I love a sunny side up egg on steak! 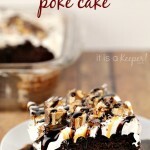 This is going on my weekend brunch favorites list! Hearty breakfasts are the best, total keeper! We love skillets! Thank you for the recipe. I am a rib eye guy all the way. In fact, I prefer the fatty part around the eye, and my spouse prefers the eye, so it is a marriage made in heaven! That’s awesome! I love when you find a perfect fit like that! 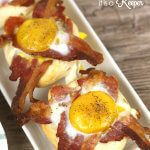 I’m always on the lookout for delicious breakfast ideas that come together quickly. Glad I found your recipe. Looks like a real keeper and I can’t wait to try it! 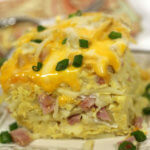 Always looking for hearty breakfast ideas, this one’s a keeper!